Well, let’s compare them side by side. One cup of cooked long grained unenriched white rice (195 grams in weight) provides about 205 calories, 4.25 grams of protein, 0.44 grams of fat, 44.5 grams of carbohydrate, 0.6 grams of fiber and very small amounts of the B vitamins and other nutrients like iron, zinc and calcium (for instance, 16 milligrams calcium, 0.32 milligrams iron, 0.77 milligrams zinc). In contrast, one cup of cooked long grained brown rice (195 grams in weight) provides almost the same amount of calories and carbohydrate, and only a very tiny bit more of protein, B vitamins and other nutrients (e.g., 5.03 grams of protein, 20 milligrams calcium, 0.82 milligrams iron, 1.23 milligrams zinc). The real difference? That same cup of brown rice provides six times the fiber content (3.5 grams) and slightly more fat content (1.76 grams) but this is comprised of a greater proportion of the healthy monounsaturated fatty acids (0.6 grams) and polyunsaturated fatty acids (0.6 grams). What I have found personally though, is that eating brown rice is more helpful than white rice when trying to control blood sugar levels, especially when one has diabetes or gestational diabetes. This is likely because the glycemic index of brown rice is just 50, compared to that of white rice being 89, for a 150 gram portion. This is equivalent to brown rice having a glycemic load per serving of 16 compared to the glycemic load per serving of white rice being 43. The glycemic index is one method of categorization which helps to indicate how quickly the carbohydrates are broken down by the body and the glucose is released into the bloodstream. For reference, glucose (a form of simple carbohydrate) is very easily absorbed in the body and has a glycemic index of 100. Brown rice does appear to be slightly more nutrient dense compared to white rice, with one of the key benefits being an increased fiber content. However, you can make up for the fiber by consuming other whole grain products and foods such as bread, whole wheat pasta, bran flakes, old fashioned oatmeal and beans . Nowadays, it is even possible to buy whole wheat bread with as much as 5 grams of fiber per slice! So don’t worry if you’re not consuming brown rice with its higher arsenic content. However, it may be worthwhile investigating if switching to brown rice from white rice has a positive impact on your blood sugar levels, if you are having diabetes or gestational diabetes. USDA National Nutrient Database for Standard Reference. http://ndb.nal.usda.gov/. Accessed August 29, 2015. I agree the only real difference is the glycemic index and if this doesn’t affect you- eat whichever you like the taste of! Thanks for your comment, and glad we agree! 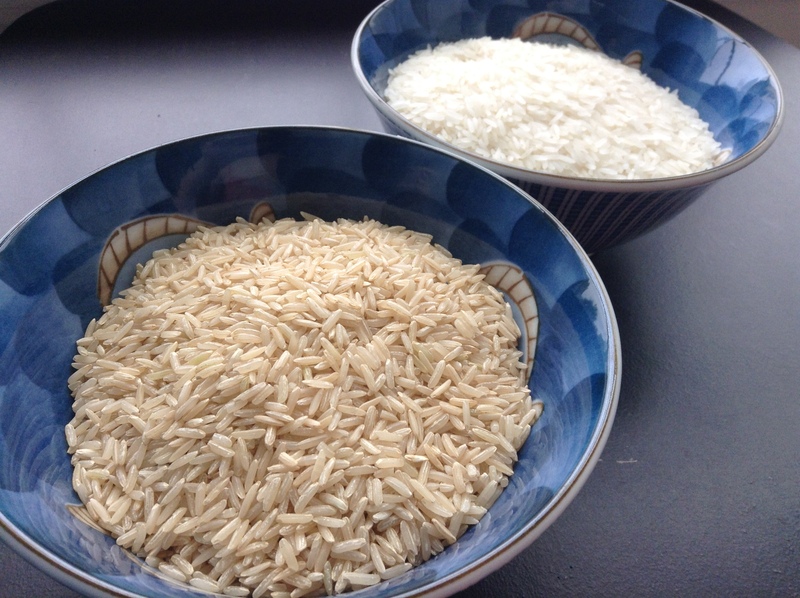 Yes, if one chooses brown rice, just be sure to check which country/region it is cultivated, and use the ‘excess’ water cooking method to reduce its final arsenic content.